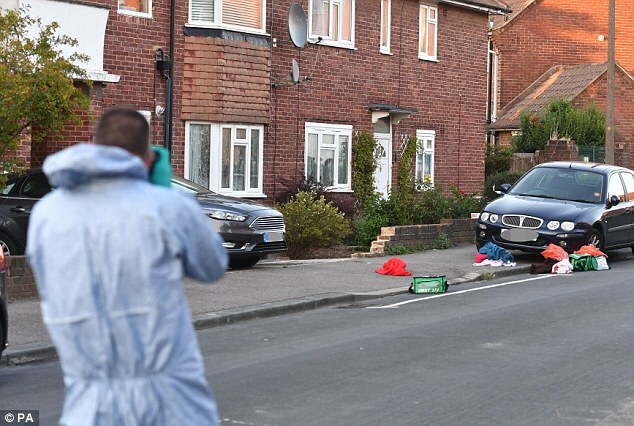 A daughter left fighting for her life along with her Polish mother after a stranger 'smashed them in the head' and left one's 'face hanging off' in an unprovoked 'hammer attack' has been named as Anna Gos by neighbours. 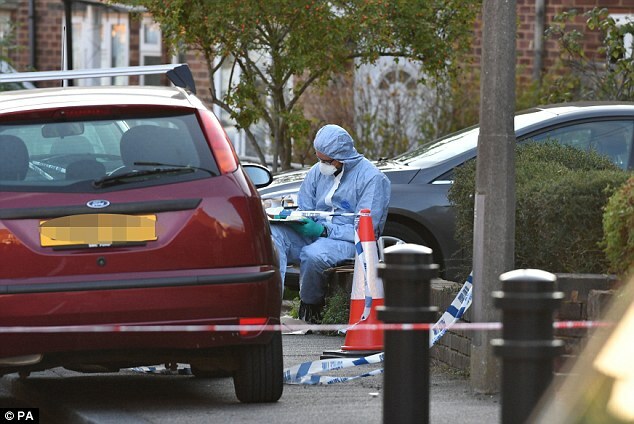 Joe Xuereb, 27, was arrested on suspicion of two counts of attempted murdered after the two women, aged 30 and 64, were targeted at Adderley Gardens in Greenwich, south-east London, yesterday. Neighbour Robert Gover, 69, said Anna's mother had been due to return to their native Poland after a visit when the attack took place. Mr Gover said Anna who ‘worked in an office in Canary Wharf', had lived with her partner, Lucas in Adderley Gardens for the last couple of years. Xuereb is said to have lived with his mother just three doors away from Anna and her sister. 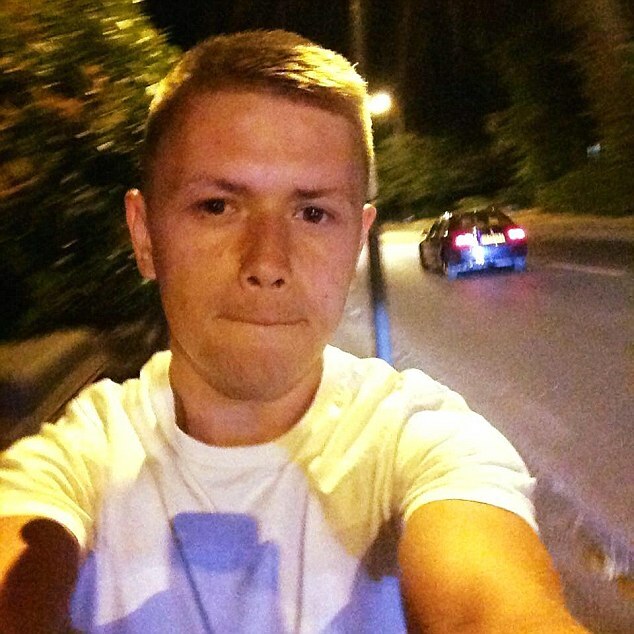 Scotland Yard confirmed they arrested Xuereb at 7.35pm, roughly two miles from where the attack took place. He remains in police custody. 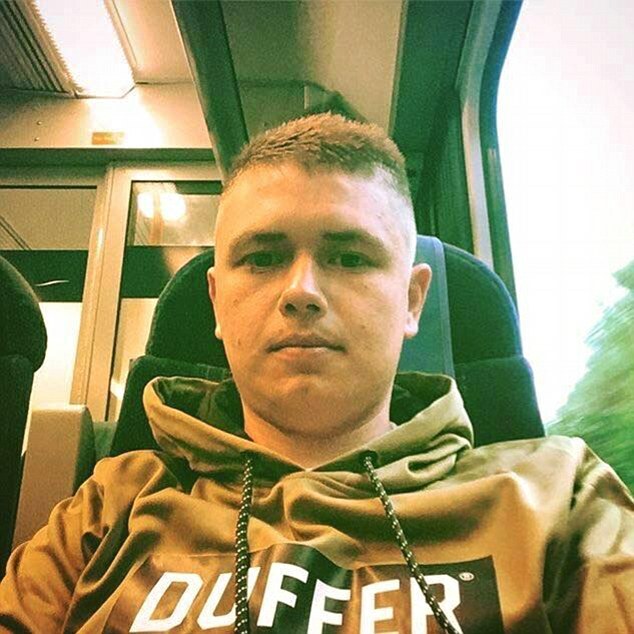 He had been spotted by a woman who then followed him in her car, until officers were able to detain him on Old Farm Avenue, Sidcup, south-east London. The suspect, from Greenwich, is thought to have mental health issues, a taser was 'deployed but not used' prior to his arrest. Officers were called at 12.10pm to find the women, aged 64 and 30, suffering from injuries 'consistent with a violent assault'. 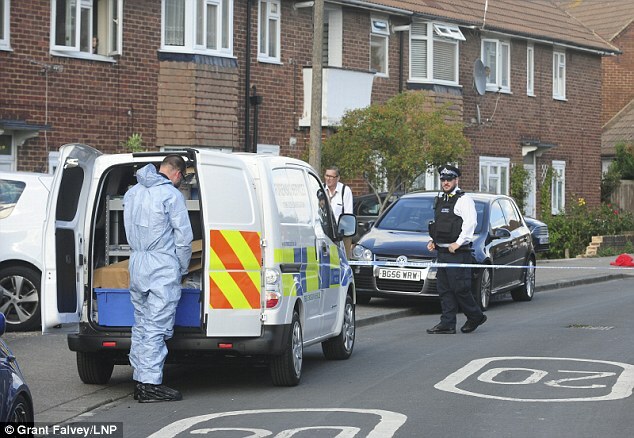 The victims are both in critical condition at a south London hospital. Retired TV engineer Mr Gover said: ‘I just spoke to Lucas and Anna had a six hour operation yesterday. The mother is in a really serious situation and having an operation today. 'I phoned the ambulance. I saw them covered in blood. I saw Anna laying down. I didn't know it was her at the time. He added: ‘Her mum was visiting her from Poland with her sister and was due to go back that day. Lucas declined to comment. He asked if his privacy could be respected at this time and is back at the flat with Anna's sister her husband, and their son. Police believe a hammer recovered from the scene 'may have been used' to carry out the 'horrific attack'. The blue front door of the two storey semi-detached house appeared to have been been battered numerous times with a blunt object. 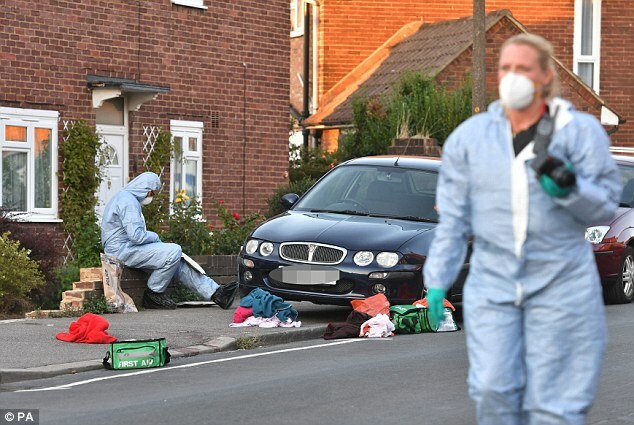 Detectives were seen yesterday searching the suspect's home, which is in the same street where the attack took place. A woman who lives nearby told how she went to the aid of the two women who had been attacked by the 'hammer wielding' suspect - while he was still swinging the weapon in the street. Neighbours said he left the scene 'calmly on a pushbike' after leaving the women horrifically injured. They described the victims 'covered in blood' while the suspect walked 'calmly' around, swinging his hammer. One neighbour, who helped the victims in the aftermath of the attack said: 'It was horrific. 'Her face was hanging off, I was trying to put her face back together. They were definitely life-changing injuries. Neighbour David Halliday, 35, saw police officers ramming the door of address on Adderley Gardens, where he said the suspect lived. He said: 'We heard a huge commotion and lots of shouting. 'An air ambulance landed in the school playing field. 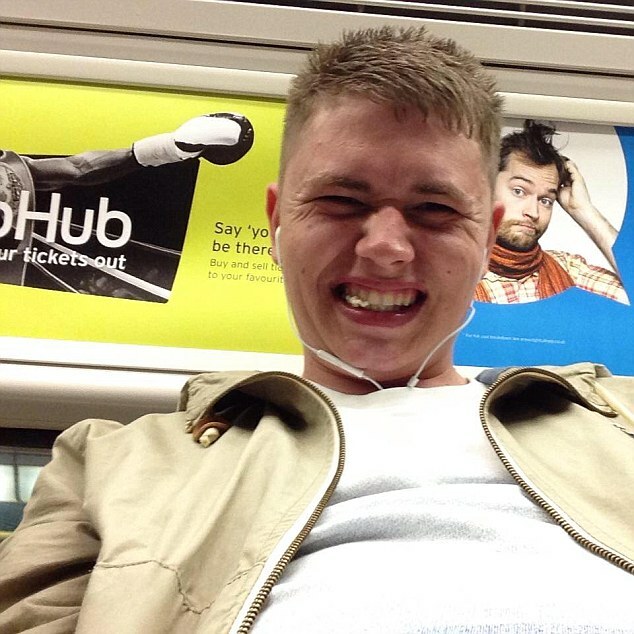 'I saw one of the woman being stretchered into an ambulance. Her body was completely covered up. 'There were two or three ambulances and loads of police cars driving round. 'They got here really quickly and there was also a police helicopter driving round overhead for a while clearly trying to find him. 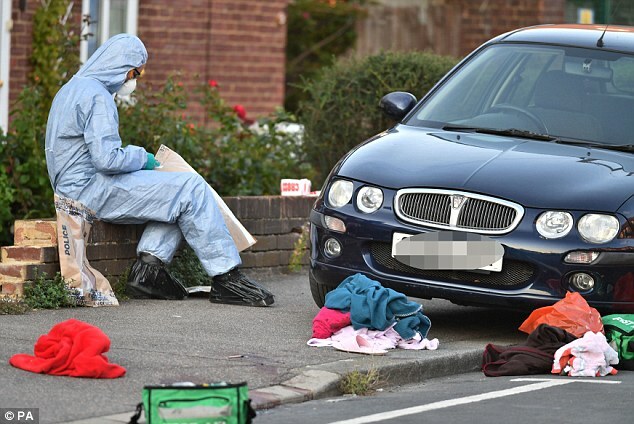 Forensic investigators were seen examining a pair of pink slippers covered in blood and blue blanket over a pavement covered in blood. 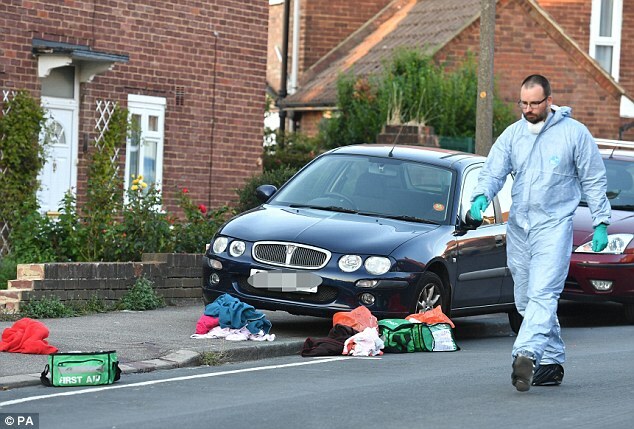 She said the suspect was still in the road while she bandaged up one of the victim's face before adding: 'When you have two women laid out on the pavement, what do you do? 'Anyone would do it. 'One of the women was choking on her own blood so we sat her up. Another neighbour described the suspect 'calmly' swinging the hammer in the street while his victims lay bleeding on the ground. She said: 'I heard screams, it sounded like kids. 'Then I looked out the window and saw them covered in blood. A lot of people were helping them. She added that he started hitting a brick wall before he 'got on his pushbike and calmly cycled away from the scene'. She said the two victims are not believed to live locally, and were visiting friends in the area. 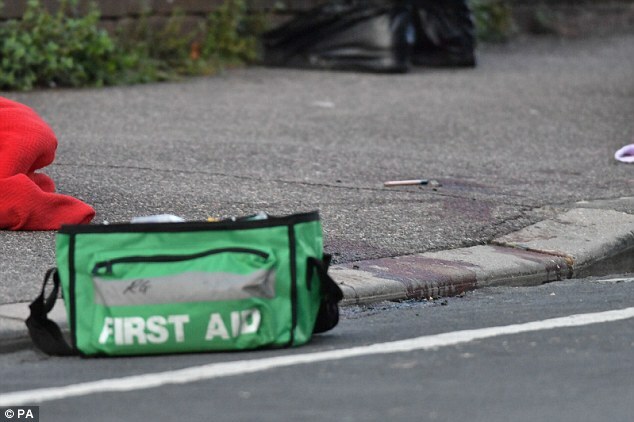 Mr Gover, who called an ambulance after seeing the attack said he heard a scream outside his window, as a passer-by saw the mother and daughter with devastating injuries. The retired TV engineer said: 'I heard a bit of a commotion, I looked outside and there was about half a dozen people out there. 'I went out there and I saw blood on the face of one of them and I knew something had happened so I ran inside and phoned for an ambulance. 'One of them was moving at the time and sitting in an upright position with somebody holding her up, while the other one was laying down. The younger woman's partner was at her side attempting to comfort her when the ambulance arrived, he said. Neighbour Joby Martin, 43, was one of around a dozen bystanders who rushed to help the victims. He said: 'we heard screaming and ran out. 'The guy was just standing there with a hammer. It was chaos there was blood everywhere. 'I don't know who the two women were. I think they might have been here on holiday because one of them mentioned a flight. 'They were covered in blood and towels. 'We could see the attacker standing there while we helped the women. Det Supt Corrigan earlier said: 'Police were called at around 12.10pm to reports of a serious assault at Adderley Gardens, Eltham. 'Officers attended along with paramedics. 'Two women, believed to be aged 64 and 30, were found with injuries consistent with a violent assault. 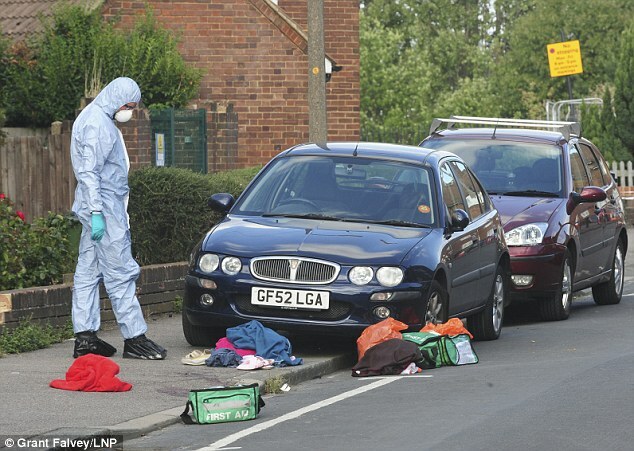 'They have been taken to south London hospitals where they both remain in a critical condition. Their next-of-kin have been informed. No arrests have been made.